The Board and Staff of Columbia County Senior Services, Inc. understand that simply depending upon grants will never provide the services needed and wanted by the 60+ and their families. We strive daily to find new ways to generate funds to support the best services possible. We sincerely appreciate your support in these endeavors. We always look for local craftsmen who want to market their products with us. The LEC Heirloom Gift Shoppe offers a wide variety of unique one of a kind, handcrafted special items for special people. For more information about our Heirloom Gift Shoppe please contact Barbara Swearingen at 386-755-0235 ext. 108. A2Z of Lake City, Inc. is a private for-profit organization which is not tax-exempt whose mission, as a Facility Rentals business, is to rent The Lifestyle Enrichment Center. The proceeds realized from renting this beautiful building support Columbia County Senior Services, Inc. The rentals of the facility are for individual and corporate special events such as meetings, weddings receptions, birthdays and anniversary parties. Contact us for more information Donna Bowen at development@ccseniors.com or call her at 386-755-0235 ext. 108. Businesses and organizations purchase advertising on LEC vehicles providing funds to help maintain a very small fleet of vans used to transport people from their homes to the Center and back daily. They are Baya Pharmacy, Whiddon Roofing, Odom, Moses/Raymond James, G.W. Huter, Inc., O’Neal Contracting, Lake City Medical Center, Rountree Kia/Ford, Mederi Caretenders, and the Wheeler Agency. For more information contact Donna Bowen at development@ccseniors.com or by calling her 386-755-0235 ext. 108. In addition to the Heirloom Gift Shoppe, A2Z, and Van Window Advertisements, every Friday we have a big indoor yard sale. We also from time to time offer special projects for sale in an effort to raise funds. Currently, we are selling a 2018 Calendar which features some of our participants and local community interest people. This is such a great way to support the Lifestyle Enrichment Center so that we can continue to bring these wonderful programs to our 60+ community. 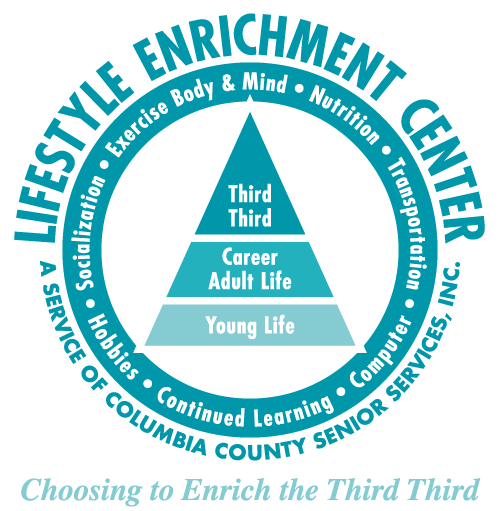 This phrase refers to the third third of life — after youth and career — when you can do what you want surrounded by the activities offered at the Lifestyle Enrichment Center.